Ms. Norwood from the MLK Head Start center spoke to the Council about the great first day of school and also informed them of the new curriculum/software being funded by grants. These grants include funding for Letters Alive Smart Board software, curriculum for Green Market collaboration, and an in-class aquarium. Monica Hargrove addressed the Council on the condition of Posey Road and provided pictures as well. The Council then explained the process of applying for State funds through the Capital Outlay program to repair the road. The process can take 2-4 years to take place. Five Parish roads were selected for funding in the last legislative session and it could take up to seven years to get the projects funded. Also, 25% of the funding has to be matched by a local entity. 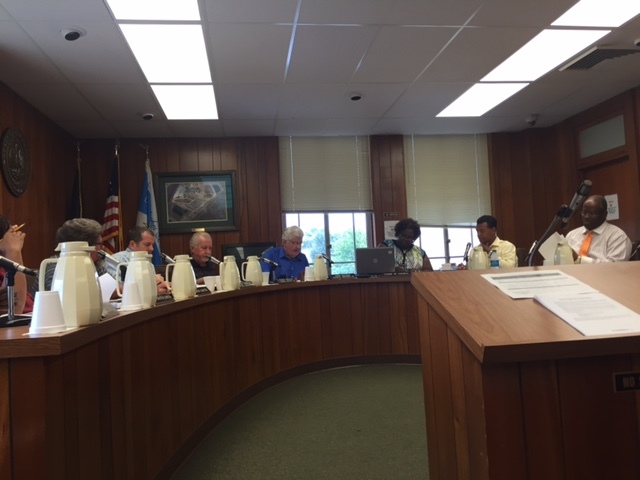 The Parish is currently trying to budget for 25% of one of the road projects for the 2016 fiscal year. Ed Bradley, who lives on Bernie Road, also addressed the Council about his road needing to be bush hogged as well as the need for ditching on the road. Don Colombel addressed the Council concerning Posey Road and referenced the parts of the road that did not need to be repaired. He suggested looking into grants for historical sites to help fund the repair of the roads to one of the historical churches on Posey Road. The Council authorized the Parish President to enter into an agreement with GOHSEP that will allow the Parish to use them as the funding agent for the funds from FEMA for the road repairs caused by the recent flooding. This is a standard agreement that names GOHSEP as the “pass through” entity in the federal reimbursement process. After a public hearing was held, the Council adopted Ordinance #07—2015 to remove Parish Road 343-A known as Bud Boyd Road located in Campti, LA from the Parish Road System. There were no comments from the public or the Council on this Ordinance. The Council also adopted Ordinance #08-2015 Budget Amendment for the 2015 Operating Budget. Revisions were made to bring in the cash budget, the actual cash amount was put in, and changes were made in the severance tax, highway department and insurance budgets. In anticipation of the upcoming LCDBG grant application period, the Council approved a Citizen Participation Plan/Citizen Complaint Procedure; appointed Sheryl Frederick as Citizen Complaint Officer for compliance with the LCDBG program; authorized the Parish President to proceed with the development of the LCDBG application taking into consideration the views and proposals submitted by citizens that attended the public hearing as well as those that were unable to attend and views of the governing body; that a Procurement Policy be adopted for compliance with the LCDBG program; and that the Parish President proceed with the procurement and selection of professional services for the purpose of assisting in the development of the LCDBG application and implementation of the project (possible discussion of firms to be considered for administrative and engineering services). In other Parish business, the Council authorized the Parish President to obtain bids for the construction of the required concrete slab and chain link fence for conversion of the uncontrolled garbage bin site at Readhimer to a mini-compactor station. The Council led a brief discussion regarding the office space for the Council Clerk. Councilman Chris Paige stated that he was very troubled by Ms. Fredrick’s office situation and urged the Council to find a better option. Ms. Frederick stated that she had requested the office space be constructed for her but she did not feel as though the space provided her with enough privacy. Mr. Paige suggested that she be provided space at the Office of Community Services. The possibility of space at the Parish’s Live Oak Building was also discussed. An amendment was added to the agenda to discuss the opportunity for the Council to be a nonfederal entity that would sponsor the ongoing project to help the St. Augustine church near Melrose with their serious erosion issue. They are receiving federal funding because the church is registered as a significant historical site, and the funds will pay for the feasibility study. The project is projected to cost roughly $70,000, and if the Council were to agree to sponsor, then they would only be responsible for 50% of any costs over $100,000. The Council agreed that this was a serious matter, especially because of the potential damage to homes and the closing of Hwy. 484. An Ordinance was introduced to start the process for the approval of this project. Renovations to the MLK Center are complete with great upgrades in the facility and technology. Applications have been received for the position of Head Start Director from in-house employees Erica Dupree and Patricia Telsey. Interviews have been completed and the Selection Committee will submit their recommendation on these candidates to Mr. Nowlin and the Policy Council. Mr. Nowlin will accompany Mayor Lee Posey, Juanita Murphy and Sheriff Victor Jones to tour an animal shelter in Baton Rouge as a possible entity to potentially help bring a shelter to Natchitoches. As for the situation at the St Augustine situation with erosion from Cane River lake require the Cane River Waterway Commission to put up the funds to cover this cost. They have money that could and should cover this cost .